A team of astronomers led by members of PlanetS has discovered five new planets with periods of revolution between 15 and 40 years. It took 20 years of regular observations to achieve this result. Over 4000 exoplanets have been discovered since the first one in 1995, but the vast majority of them orbit their stars with relatively short periods of revolution. Indeed, to confirm the presence of a pla- net, it is necessary to wait until it has made one or more revolutions around its star. This can take from a few days for the closest to the star to decades for the furthest away: Jupiter for example takes 11 years to go around the Sun. Only a telescope dedicated to the search for exoplanets can carry out such measurements over such long pe- riods of time, which is the case of the EULER telescope of the Geneva University (UNIGE), Switzerland, located at the Silla Observatory in Chile. These planets with long periods of revolution are of particular interest to astronomers because they are part of a poorly known but unavoidable population to explain the formation and evolution of planets. An article published by the journal Astronomy & Astrophy- sics. “It took 20 years and many more observers,» comments Emily Rickman, member of PlanetS and first author of the study. “This result would have been impossible without the availability and reliability of the CORALIE spectrograph installed on the EULER telescope, a unique instrument in the world.” Since 1995, when the first exoplanet was discovered, about 4000 planets have been found. The vast majority of them are massive planets close to their stars which are the easiest to detect relying on the current technology. However, planets with long periods of revolution are of great interest to astronomers. Being farther away from their stars, they can be observed using direct imaging tech- niques. Indeed, to date, almost all planets have been discovered using the two main indirect methods: radial velocities, which measure the gravitational influence of a planet on its star, and transits, which de- tect the mini eclipse caused by a planet passing in front of its star. 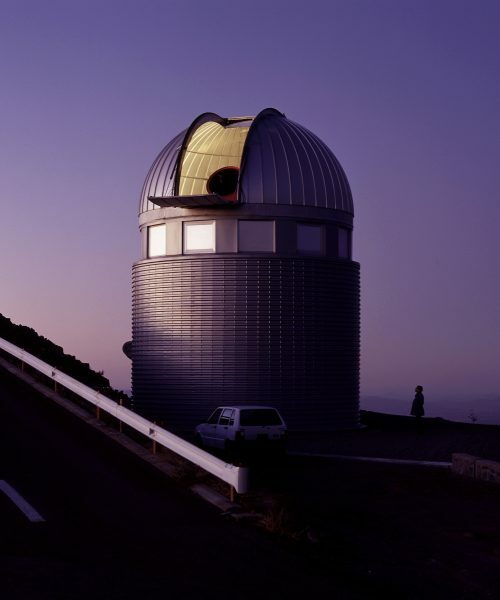 The EULER telescope is a telescope that depends only on the UNIGE Astronomy Department and is mainly dedicated to the study of exoplanets. Since its commissioning in 1998 it has been equipped with the CORALIE spectrograph which allows to measure radial veloci- ties with an accuracy of a few meters per second, allowing for the detection of planets which mass is as small as Neptune’s. “As early as 1998, a planetary monitoring programme was set up and carried out scrupulously by the many UNIGE observers who took turn every two weeks in La Silla for 20 years”, says Emily Rickman. The result is remarkable: five new planets have been discovered and the orbits of four others known have been precisely defined. All these planets have periods of revolution between 15.6 and 40.4 years, with masses ranging approximately from 3 to 27 times that of Jupiter. This study contributes to increasing the list of 26 planets with a rotation period greater than 15 years, “but above all, it provides us with new targets for direct imaging!”, concludes the PlanetS researcher.